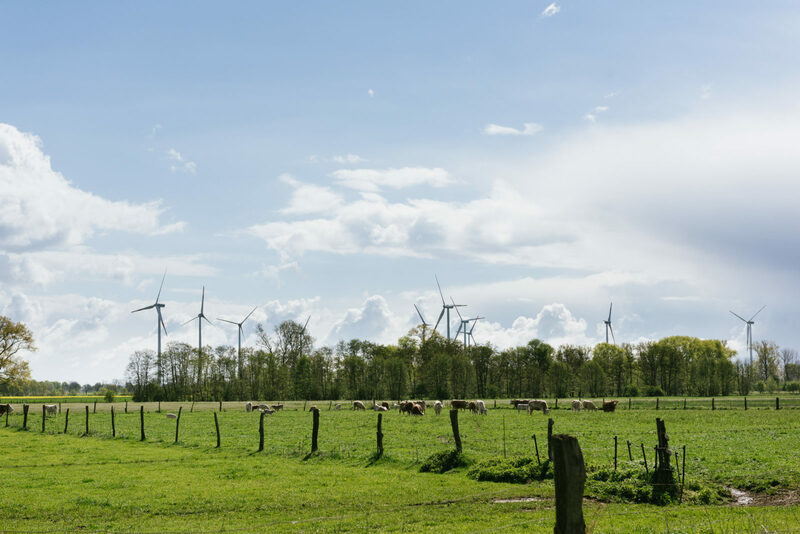 (EN) Miles of greenery, a few windmills and happy cows in the field: The neighborhood surrounding the house of journalist, Anna Schunck and cameraman, director and photographer, Marcus Werner, close to Neuruppin in Brandenburg just screams of country living. (EN) In this area, just an hour’s drive from Berlin, the couple bought an old farmhouse. Discovered online one hungover Sunday morning about two years ago, they now live here with five sheep and their cat, Tisa. In doing so, they’ve opted for a housing situation that so many Berliners secretly dream of: fresh air, nature and tranquility. However, the two still keep a backdoor to Berlin open. They never wanted to give up their apartment in Neukölln. We discover why they choose to base themselves outside the city, what sustainability has to do with it and why they believe more people should go to Brandenburg. (EN) Seeking sunshine? The chairs and coffee are waiting. (EN) Growing plants on the flower bank. (EN) Anna and Marcus plan to put in a large vegetable garden behind the house. But first, they want to start small. (EN) Two of the five sheep follow Anna and Marcus around all day. Now Cow is getting a nice rub with the brush. (EN) You’ve lived here for a year. Do you know the whole village already? (EN) Anna: We still don’t know everyone and that’s our own fault in a way because we still haven’t had a we-are-in-the-neighborhood-now sort of party. But by now we know quite a few and many from the next village over, too. For example, we have neighbors we like to drink coffee with and who often help us to bring in the hay for the sheep. (EN) Small town communities can sometimes be a bit closed. Were you worried about that? (EN) A: You can’t really approach it like that. Either you get into it or you leave it. Aside from the fact that I tend not to say, “people are definitely like this or that”. That makes it much harder to approach them. When you move to the country, you should do it without any reservations otherwise you’ll have no chance of settling in. Marcus: Now we get birthday invitations and invitations to help set up the maypole. We definitely feel included. And we’re interested in it, too. We all know that Berlin is a bubble. We still spend quite a bit of time in Neukölln and always with ‘like-minded people’ when we do so. And that’s great. But by doing so, you lose your connection to reality a bit; to the rest of Germany. The fact that you can live in that kind of intensity just one hour’s drive from Berlin is pretty cool. (EN) You both grew up in the city. You in Gera, Marcus and Anna in Flensburg. 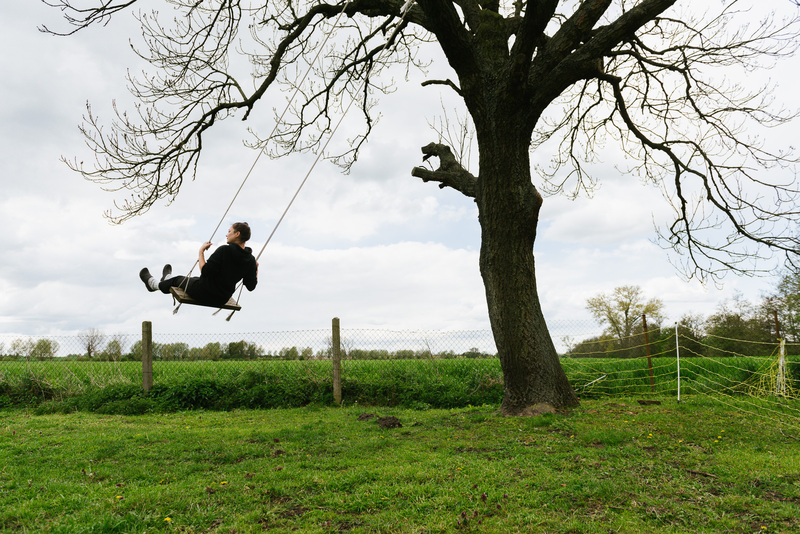 How much time did you spend in the countryside as children? (EN) M: I really grew up in the apartment blocks. Those typical East Germany apartment blocks. But I still felt a connection to the countryside and my parents used to have a garden. I used to hate going out there! But then again, there was no electricity or no running water. I just wanted to be in the city. In 2002, I moved to Berlin. My interest in the countryside came about only a few years ago. A: We always had a garden at our house, so I already had a flowerbed, mowed the lawn, spent time outside – and always thought it was great. Then I lived in the city for a long time. In Hamburg. And like Marcus, as I grew older, my desire for quiet and nature began to grow in comparison to the hustle and bustle of the big city. (EN) What was it that made you guys decide on the house and everything that goes with it? (EN) A: Intuition, being up for it, spontaneity and madness. M: A gut feeling. With Berlin, I had the feeling that the city was somehow played out. I was finished partying. I experienced Berlin in a very, very exciting time and grew up in it. Got to know a lot people and found a great circle of friends there. But whenever I went out, sometimes on the canal or the old Tempelhofer airfield, I always went to the same spots. I needed something new. And mainly I found them outside of the city. A: The rush of fresh love was part of that and it gave us courage to see it through. We were together for about half a year when we decided that we wanted to do this. (EN) How did your friends react to the decision? (EN) M: My friends and family said it didn’t seem like me at all when we bought the house. And I then just decided for myself: This is me now. I’ve evolved and found new interests. A: I think my whole circle of friends assumed that I would grow old in Hamburg. I was always a workaholic with too much going on in my private life. Never had any time. And the fact that we kept the apartment in Berlin, that wasn’t set in stone from the beginning. But today I’m really happy about it. I feel at home here in Brandenburg and it’s my “happy place” – but really only in combination with the city. I can’t imagine completely living in solitude and seclusion. I still need the inspiration and well-being of urban space. (EN) Does the time in an urban space make you appreciate your home in the country? (EN) A: No, it’s the other way around. M: Ever since we’ve moved out here, we always look forward to heading back into the city every time we go. We drive back and we sit in the cafe in Neukölln… You just look at people and their style and see what’s become commonplace in the bubble. (EN) How often do you travel to Berlin now? (EN) A: I’d say we spend just more than half of our time in Brandenburg. In other words, we head into the city about once a week. But if it’s Christmas or just simply amazing weather, then we may hang around for three weeks or so. Then there are also times where there are three dates, an event and a birthday in Berlin. Then we may spend several days in a row there. (EN) The move seems to have influenced your whole life, including your professional life. Shortly after the move, you launched your magazine Viertel \ Vor, which is all about sustainability. (EN) A: Yes, though the idea for the house and the idea for the magazine actually came at about the same time. In that stage of life, with it being “all too much” and the question of what’s really important to us – for our lives and in our work. We’ve worked for a lot for agencies, brands and publishers but not while directly influencing their approaches. That’s how the idea of the magazine came about. Actually, both come from being supersaturated by “the colorful advertising wall”. Two independent ideas that now fit together. But we didn’t really hash out the switch on the blog. And the fact that the move is now arousing interest is nice and certainly drives our work but it wasn’t necessarily the plan. M: It fits with the topics for sure. We’re learning a lot by being out here. We’re very close to everything that’s going on around us, like the agriculture. That, on the other hand, is fundamental for everything that happens in Berlin and in every other city. Because our food comes from here and because the processes take place here that allow the city to be sustained. That’s why it’s super important what’s getting sprayed on the fields out here, how the cows are kept and whether there are bees or not. In the city, people are completely cut off from those contexts. You go to the supermarket and grab things from the shelf until the basket is full. But people have no idea how long it takes from something to grow. (EN) Would you have made this magazine even if you had stayed in the city? (EN) M: Yes. We started with the magazine as novices in this field and were our own target group. We’re not your typical eco-freaks or activists but we think it’s important to address sustainability and to convey the topics in a way that will help our friends or city-dwellers be concerned with it. A: …and perhaps also be role models. We need new role models. There are so many people who do absolutely important things like save the bees or fight for fair fashion and who would have super hype potential but no one presents them as role models. M: The industry grabs someone, gives them new outfits and shows everyone how cool they are. But it’s just an acquired form of cool and doesn’t come from the person making the world better or having an interesting opinion. I would hope that Nike or Adidas or other brands would, for example, take up the opponents of lignite from Fossil Free or Ende Gelände and set them up. Then they could run around in the clothes and occupy the lignite dredgers. Those are role models for me. We also want to take the magazine there. That reconsider the brands and promote people that are ready. (EN) How can we bring more nature and sustainability to the city? (EN) M: I think a city will always be a city. And that’s a good thing. All of the processes that are done there are also important. Of course, what would be good is if people would be more conscious consumers. A city means more consumption and will always be consumption. Not everyone can start their own field. It’s great that we have community gardens in order to experience it but they won’t be able to supply the whole city. However, it can create consciousness for what’s being consumed. The city government must ensure that a city is created that’s worth living in, that’s more bicycle-friendly and offers alternatives to car traffic. So that people say on their own: I don’t want to have a car. I ride a bike because it’s healthy, it doesn’t create any exhaust, it’s cheaper and there’s no stress with parking. We need these incentives. There are a lot of concepts and Berlin is on a good path but not as much as Copenhagen, for example. (EN) How sustainable is your life here? You drive your car quite a bit. A: Sometimes the will is there but there’s a lack of implementation. We’re also not zero-waste, as many believe. We also produce garbage but try to consume as little plastic as possible. I haven’t bought any new clothes for almost a year. And we have green electricity. There are so many small ways to change something, like the reusable coffee cups. But there are also great, simple possibilities just like changing your electricity provider. (EN) For the first time in 20 years, more people from the city are moving to the country than vice versa. Do you think this development will continue? (EN) M: We’re getting interest in what we’re doing here. Everyone we tell about it says: “Wow, that’s my dream!”. I find it remarkable that hour-long distance from Berlin hasn’t become enormously popular. You can still find something like this here on real estate portals without having to do much for it – and for a price that’ll get you a garage in Munich. The potential of Brandenburg having Berlin at its heart is unbelievable. (EN) Do you think it would be a good thing for all of us to come here from the city or would that be too much for you? (EN) M: I am happy about anyone who does something here and brings the city along. It would be so nice if there was a hot cappuccino around the corner – without it becoming, as one would say in Berlin, a “hipster neighborhood”. The thing is that there are many old people living here but no young people replacing them. That’s a fact. These houses are unoccupied for now. That’s why some of the people in the villages are thankful when someone comes and wants to buy the house at the end of the street and keeps it from falling apart. A: Gentrification would be awful. If the Brandenburgers had to leave because Berlin is coming, it wouldn’t be any good. But in general, there’s nothing bad to say about it. For instance, there’s a village nearby where there are about fifty percent Berliners and fifty percent Brandenburgers. It’s a beautiful, lively place with a higher-than-average number of children and where the mix of city and country people works quite well. I think it’s very important that people from the city move to a sparsely populated state like Brandenburg. It would be a real shame if it didn’t get used. Everyone come and join us! (EN) for inviting us to your house. 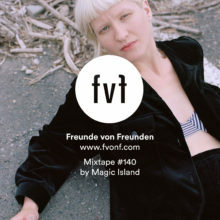 You can find more info about these two and a lot of interesting ideas about sustainability in their magazine Viertel \ Vor. More insights into the life of Anna and Marcus can be found on their Instagram account. This portrait was created in cooperation with Manufactum, who value sustainability and high quality design just as much as we do.